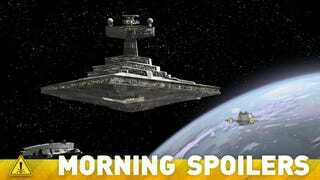 Has the Star Wars Episode VII Villain Been Revealed? There's more information on Marvel's Phase 3 and Age of Ultron than you can shake a hammer at. The Scream TV show is officially happening. Check out new photos from this week's Doctor Who, and the first Agent Carter footage. And is Warner Bros. already looking for a Harley Quinn for its Suicide Squad movie? Spoilers now! Did you tell them that? Okay, I'll play. I'll play along. Yeah, yeah. There's a really important relationship between…[Laughs] I was just happy that I was in the movie at all! And any scenes that I got to be with her were...a big bonus. Basically, Tony took the orphan Banner into the fold. I was just made aware of where my apartment was in the Stark Complex...the Stark Tower. And so, you know, I think they're working together. I have a Lab and Banner's working on a lot of stuff. And Tony's working on his own stuff and they complement each other. And so you could tell that when we get into this film that they've been working together. And they've gotten even more of a short hand together. So that's been built out quite a lot and it's fun. It's cool. it's not really that. It's more...I always read this as the concept that every impulse starts off as a positive impulse, you know? Even the impulse to kill starts off as an impulse to change, to rail against, to challenge the authority in a very direct and permanent solution to a temporary problem. And I think because Tony's solution is what becomes the problem in a way that's really kind of interesting. And it also ties into The Vision. I don't think you can call James Spader [who plays Ultron] a bad guy. But he's scary and kind of hurt. So to me there was a Rubik's Cube to how not to make these things happen. When you get to Act Three, you're just going 'I really hope you like Acts One and Two, because now we're just gonna do all this stuff!' I think it was the same thing in Iron Man 3, Act Three was the strongest act. And I think that this film is really gunning for that sort of thing. And now I feel like rather than Tony kind of like putting it all down, he was just kinda saying, 'Alright, job one is roughly taken care of.' And I think this is job two. Job two was to go back East and get people organized and do what I can. And also, I love that Tony's not one of those superheroes who's ever lost his money. [Laughs] Which is great. He's never lost his dough. I think what he's trying to do is kind of set up shop where eventually this can be...It's like eventually you just gotta hand this over to the vendors so they can finish the job. And I think that's kind of what Tony's thinking, you know? We head to Chicago after this, then a couple more locations but we're getting close, as they say. It's a long shoot. ... I feel like there's a really good chance we'll be back. We have a couple of established locations here that I think if we make another movie, I'm knocking on wood here, we would have to come back and shoot those. That would be fun. I think the last time I called, we talked a little bit about Aquaman, but it hadn't been announced that Jason Momoa was gonna play Aquaman. I was trying to protect you guys from his wrath. The man is a monster. The guy is awesome and he's so passionate. I was hanging out with him here in Detroit and he was loving on it so hard. He's a great guy, but like I say not a small individual. It's so weird! It's the weirdest thing. She's so special to me. She has a darker path than I ever wanted to really play with, because I think that makes me a little sad that she's gone through a few really terrible things. But it's interesting, because I can connect with her on that level to a certain extent as well. I don't know, she just really warms my heart. IGN: I'm also curious about the dynamic between her and her mom, since we're going to be seeing this very key figure from her past show up. Rickards: Ah, yes. That's a whole thing. They are completely different people, except for their ability to really, really care. She definitely has the maternal gene from her mother. Her mother really tries, and that effort doesn't go unnoticed. "If you're a fan of comics, you're really going to enjoy the reveal of Ra's al Ghul — like, the first frames of seeing him," he says. "That's going to be pretty cool and create a lot of chatter." Anyone tuning in to see the two of us onscreen at the same time will not be disappointed. We've got a lot of scenes together. I just wrapped my second episode — Dom's first — in Vancouver and it was a blast. And a blast from the past. Dom and I played brothers for four years, and we developed a bond that really does feel brotherly. It was a lot of fun to tap into that but also push into new creative territory. This isn't "Michael and Lincoln Take Two." But there are moments that did feel a little wink-wink-nudge-nudge. Let's just say it was a good time. All I can really say is Charlie definitely comes back from Oz and she's brought back something that's pretty scary. She's going to have to confront it with the boys. One of the great things about knowing you're working with Felicia is she, as an actor, really gave us permission to let her character grow. So we've always tried to tell a new chapter of Charlie's life when she appears. I always believe that every character is the hero of their own story and that' definitely true with Charlie. This episode is another chapter in her ongoing journey and continual growth as a character. We're starting where comic books kick off, we've got the whole canon in front of us, we're actually taking stories directly comics. My favorite story is "Dangerous Habits." It's badass, it'll take us a long time to get there but that's good a can grow before we get there. The pilot till now has been such a journey, but everything gets better…I feel like we are in a place where true fans of the comic will be happy. Lots of episodes will be lifted out of the comics with a few tweaks. A DEMON WITH A KILLER APPETITE IS UNLEASHED IN ATLANTA - JONJO O'NEILL GUEST STARS — When Constantine's (Matt Ryan) old friend Gary Lester (guest star Jonjo O'Neill) accidentally releases a powerful demon in Atlanta, John is forced to determine exactly what he is prepared to sacrifice in his battle with the underworld. Harold Perrineau and Angélica Celaya also star. "Point of Origin" – Reese volunteers as an NYPD police academy instructor in order to keep an eye on a talented young officer whose suspicious actions make him question her motives. Meanwhile, Martine – armed with information from Samaritan – hunts a member of the team, on PERSON OF INTEREST, Tuesday, Nov. 18 (10:01-11:00 PM, ET/PT) on the CBS Television Network.